Jenna is about 12 years old and came into CPL care with her daughters Bubble (already adopted) and POPPY (see separate advert) because their owner moved and was unable to take them along. Jenna is a calm, confident senior. After 11 years as a parent she seems rather over her daughters and would prefer her own space as an only cat in a quiet home. Jenna has just had vet treatment on a small lump on her nose, and this is healing well. Please note that th photos were taken before treatment. 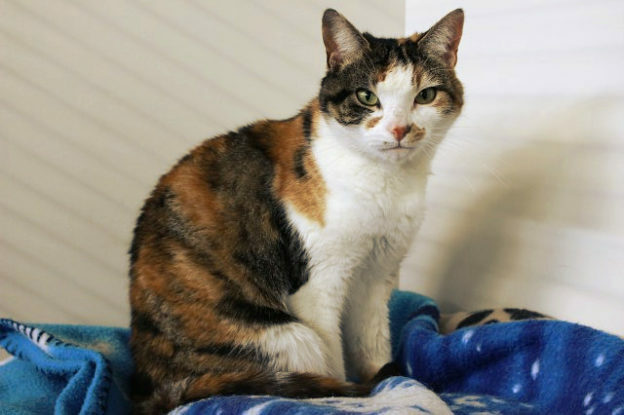 Adopting an older cat can be very rewarding and they make great companions. As they are less active they tend to spend more time indoors and are less likely to get lost or injured. They are particularly suitable for owners who are themselves less active and/or spend most of their time at home.